The archaeological and traditional Egyptian history of music is much more abundant than in any other country. 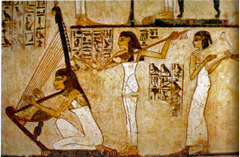 The wall reliefs of the Ancient Egyptian temples and tombs depict numerous types and forms of musical instruments, the techniques in which these instruments were to be played and tuned, ensemble playing, and much, much more. and the wind instrument players playing certain chords together. The positions of the harpists’ hands on the strings clearly indicate ratios such as the Fourth, the Fifth, and the Octave, revealing an unquestionable knowledge of the laws governing musical harmony. 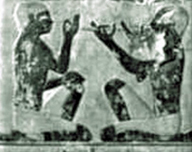 The playing of musical instruments is also depicted as being controlled by the conductors’ hand movements, which also help us identify certain tones, intervals, and functions of sound, as shown on the left in the depiction below. The intervals of Fourth, Fifth, and Octave were the most common in Ancient Egyptian representations. 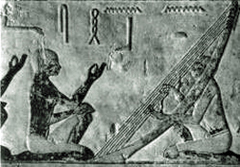 Curt Sachs [in his book, History of Musical Instruments] found that out of 17 harpists represented on Egyptian art works (with sufficient realism and distinctness to be reliable records), seven are striking a Fourth chord, five a Fifth chord, and five an Octave chord. The eight-term octave was called Harmonia or the harmonic octachord scale, and was described in early Greek writings as the Dorian octachord, structured based on the Octave, Fourth, and Fifth—the three consonant intervals. These three consonant intervals relate to the three seasons of the Ancient Egyptian calendar, as we will see later in the book. 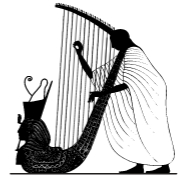 The most frequently depicted harps were found to have seven strings, and according to Curt Sachs’ study of the Egyptian instruments, the Egyptians tuned their harps in the same diatonic series of intervals. 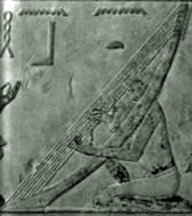 >> One of the two harps found depicted in Ramses III’s tomb has 13 strings, where if the longest string represented pros-lambanomenos, or D, the remaining 12 strings would more than supply all the tones, semitones, and quartertones, of the diatonic, chromatic, and enharmonic genera within the compass of an octave. In addition to the numerous representations of musical scenes pictured in temples and tombs from all periods throughout Egypt’s dynastic history, we also have access to hundreds of various Ancient Egyptian musical instruments that have been recovered from their tombs. These Egyptian instruments are now spread in museums and private collections throughout the world. a. several types of musical scales were known/used. b. narrow-stepped scales were common from the earliest known Egyptian history (more than 5,000 years ago). c. playing and tuning techniques of string instruments provided solo and chordal playing of instruments. d. playing techniques of wind instruments provided small increments and the organ effect. e. both the cyclic (up-and-down) method and the divisive method of tuning were in use. 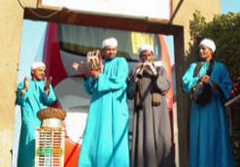 After the demise of the Ancient Egyptian Pharaonic Era, Egypt continued to be the learning center for music, for the Arabized/Islamized countries. 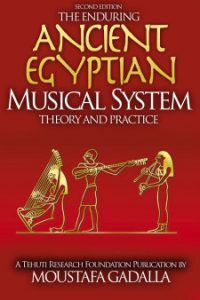 All these findings, together with the early historian writings of Egyptian musical heritage, as well as the traditions of modern Nile inhabitants, corroborate to provide the most authentic case of the musical history of Ancient Egypt. Unfortunately, much of this CLEARLY EGYPTIAN evidence has been distorted time and time again throughout history, by Western academia. 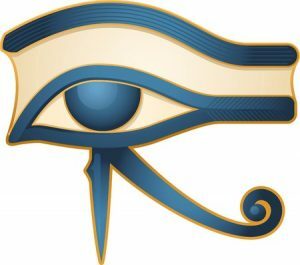 On the subject of Ancient Egypt, practically all Western academicians have contempt and envy towards this great civilization. The typical Western academician will simultaneously: 1) describe Egyptians as being very conservative, who didn’t change or evolve and who had no imagination, etc. ; and 2) describe the achievements in Ancient Egypt as being borrowed/stolen/copied from non-Egyptians. It is irrational for anyone to simultaneously employ these contradictory arguments.